August 1, 2015 has come and gone. “Making all Things New” has been concluded – if this “process” will ever have a termination. 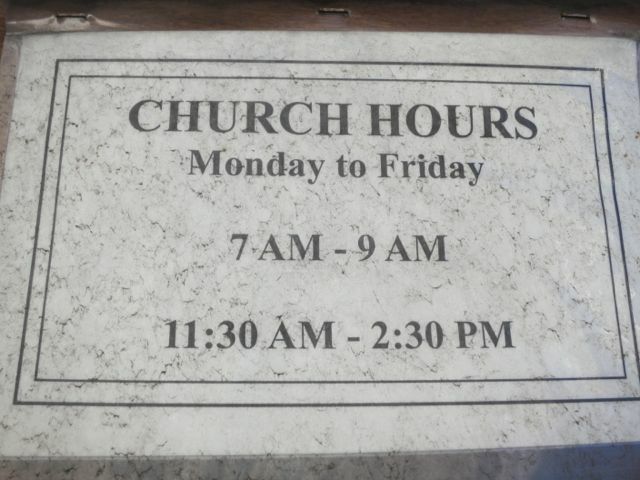 Churches have been closed – subject in some cases to ongoing legal battles. Others remain open but have been combined into one parish. 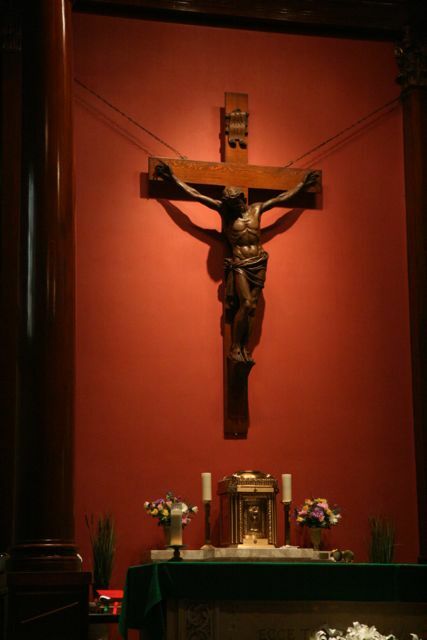 We understand that situations where one parish has two churches will be reexamined in two years – so for some churches it will be only a temporary reprieve. 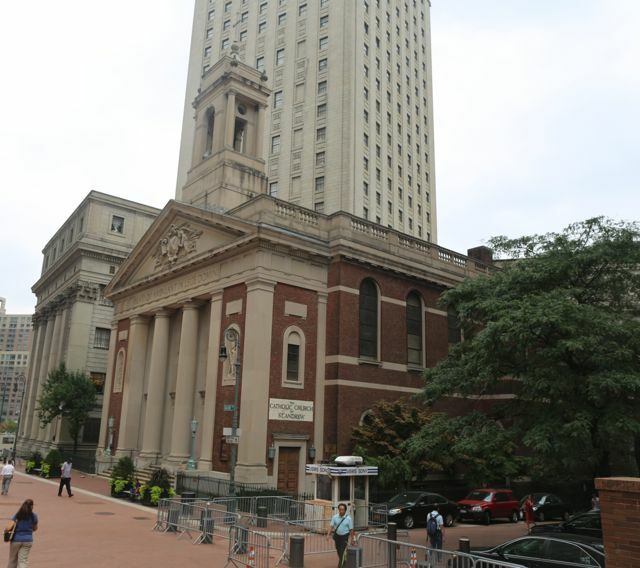 St. Andrew’s, in the midst of New York’s downtown court and government center, is one of the latter churches. One of the older parishes of the city, organized in 1842, it has now been absorbed by the much more recent parish of Our Lady of Victory to the south. St. Andrew’s neoclassical/Georgian/Federal facade fits in well with the colonnades, grand arches and mock temples of the grandiose classical and beaux-arts civic buildings that surround it. But the present church is actually a relatively recent construction – dating from 1939. The history of this parish is long and tumultuous. It was situated on Duane Street adjacent to one of the poorest neighborhoods of the city, . The first church was a Universalist meeting house, built in 1818 and acquired by Catholics in 1841, originally as a meeting hall. In “Carroll Hall” were held some of the first meetings agitating for Catholic education. In 1842 Carroll Hall was “repurposed” as a Catholic parish under the direction of the pastor of nearby St. James parish. 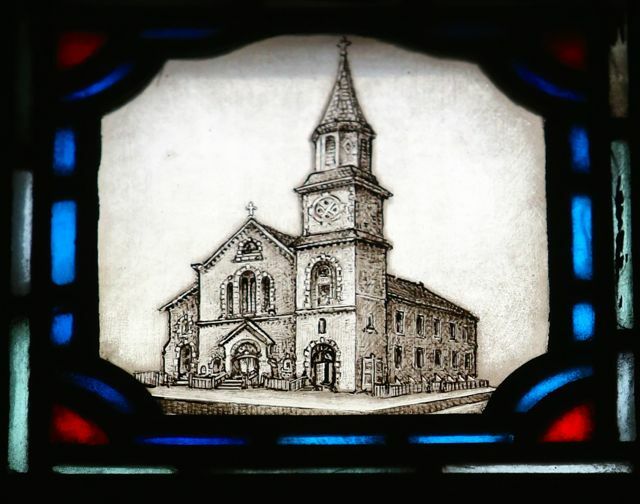 After 1859, necessitated by the widening of Duane Street, the church was extensively rebuilt, redecorated and expanded. In the course of this massive remodeling of the church a neighboring building in which George Washington had once resided was acquired and razed … On February 25, 1875, after a fire, the walls of an adjacent commercial building collapsed on St. Andrew’s when the church was full, killing 5 people – four of them crushed to death attempting to escape – and injuring many more. The church was wrecked – yet St. Andrew’s was rebuilt and restored once more. 1) Further renovations were made in the 1890’s. We learn from a commemorative plaque in the narthex that Fr. Evers also instituted a “Noonday Mass” in 1906 – a practice almost universal now in churches frequented by office workers in business districts. Such was the excitement generated at that time by what seem today to be minor derogations from the liturgical norms! 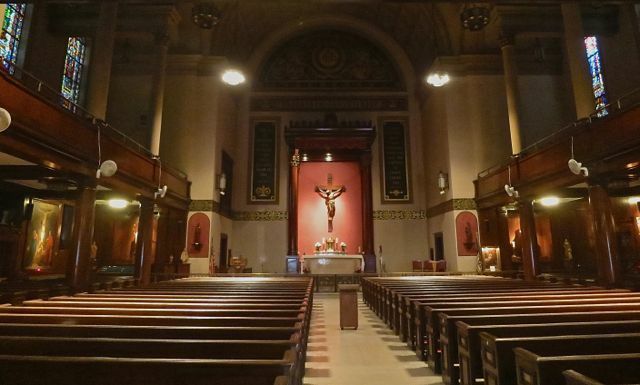 It is clear that St. Andrew’s by 1913 was well on its way to becoming a “commuter church.” The parish had a population of only 1800 when other New York parishes of that era could have tens of thousands of parishioners. 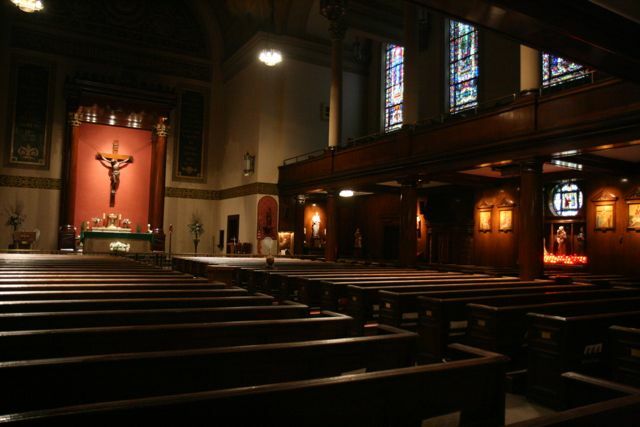 No school is mentioned – rather, the pastor of St Andrew’s directed a mission on the Bowery to “fallen men.” 4) By 1938, the modest, old 1818 church was deemed structurally unsound and in any case had been inadequate in size for many years. A grand new church was begun in a nearby location. 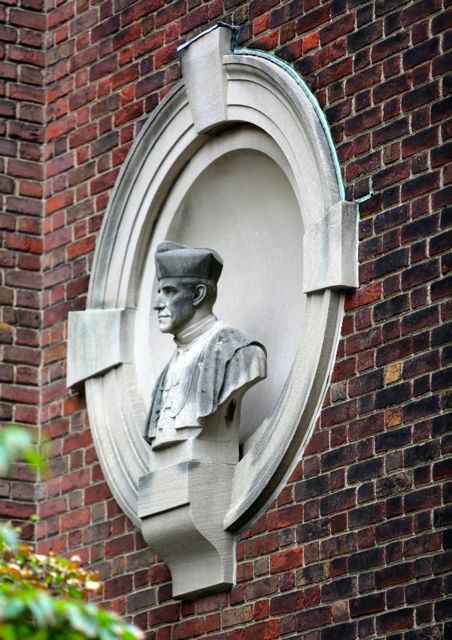 Cardinal Hayes (Archbishop of New York 1919-38) was born in 1867 near the site of the new church and had been baptized in the old – undoubtedly the Cardinal took a personal interest in these proceedings in his old neighborhood! Reminders of Cardinal Hayes are numerous in and outside this church. 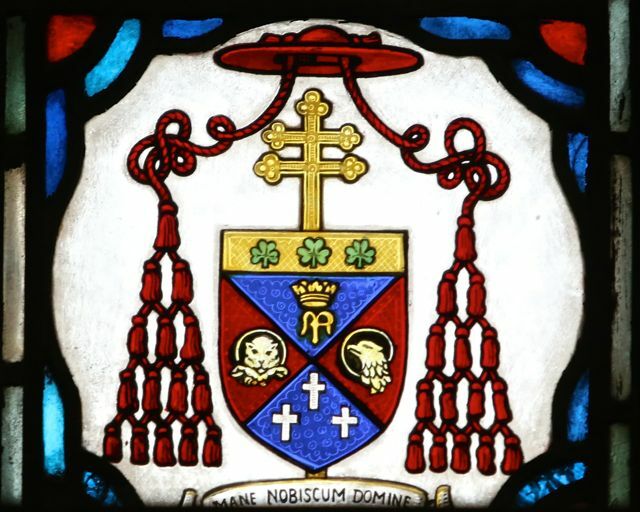 (Above) His coat of arms – from the Cardinal Hayes memorial window). (Below) A bust of Cardinal Hayes. What was new about St. Andrew’s is the use of a classical/ 18th Century English/”Protestant” architectural idiom for the exterior. 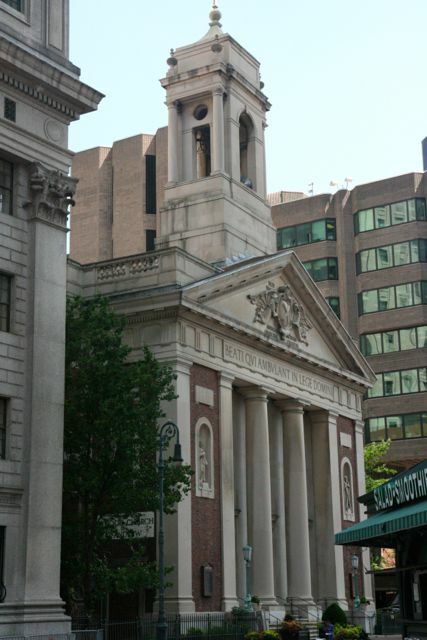 Such was also the case with the parish of Corpus Christi near Columbia University, erected around the same time. But while Corpus Christi is somewhat of a fake – a facade and decorated auditorium on and in an entirely modern small-scale high rise – St Andrew is a grandly proportioned church. 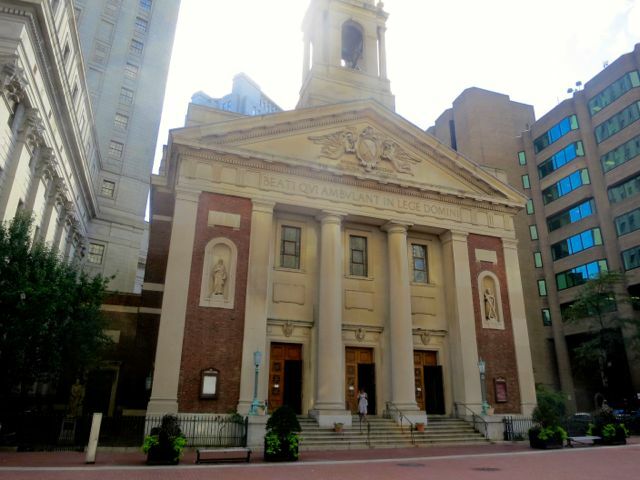 Now in the 1840’s Catholics had broken with the various neoclassical styles of the severe temples (like St. Peter’s on Barclay Street) that they and everybody else had been erecting up till then. In the age of Pugin, Catholics felt the need to return to a truly Catholic, Gothic style. The stylistic repertoire soon was expanded to include the Renaissance, Romanesque and Baroque. In the case of St Andrew’s, we encounter a reversal of this 100-year trend, and the adoption of a consciously “American” style, non-Catholic in origin. One source attributes this to a laudable attempt to blend in with the surrounding buildings – but there is surely more to it than that. Without indulging the ideological flights of fancy of one analyst of the similar architecture of Corpus Christi parish, we do find St. Andrew’s to be an important turning point. 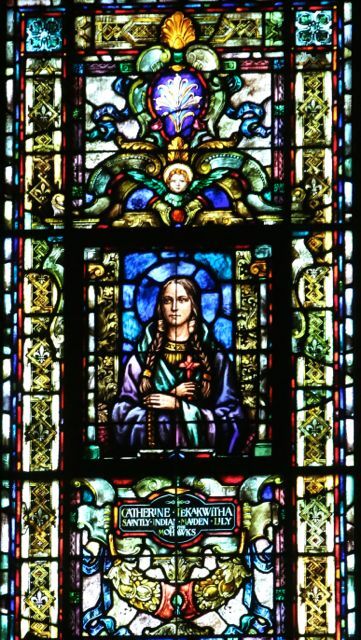 The Church now experienced the need to conform to the supposed traditions of the surrounding American culture – as opposed to seeking to influence and even challenge that culture by her own “Catholic” styles. Do we detect here, symbolized by this building, the beginnings of a developing uncertainty regarding the Church’s mission? The interior makes a more ambivalent statement. It is executed in a kind of “Renaissance” style similar to that of many churches built 30 or 40 years earlier. True, the simple, spacious hall with galleries and a shallow sanctuary harks back to even earlier New York churches originally designed for Protestant preaching. 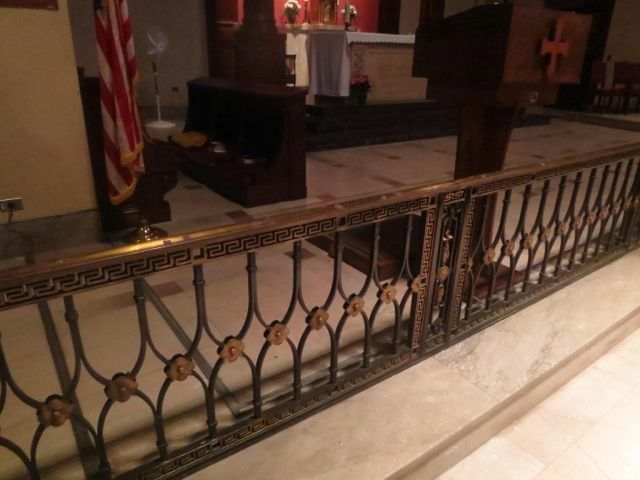 And St. Andrew’s sanctuary, unadorned except by a large crucifix framed by scriptural quotations, has a severe, “Jansenistic” appearance complemented by the intact, classical communion rail. Yet St. Andrew’s, when the electric lights are off, is also one of the darkest churches in New York – how very unlike the clarity of the 18th century! (Indeed, this prayerful obscurity, combined with the spotlights picking out paintings and statues makes the interior of this church difficult to photograph). The sombre, stately impression is reinforced by the extensive application of dark wood paneling throughout the church. 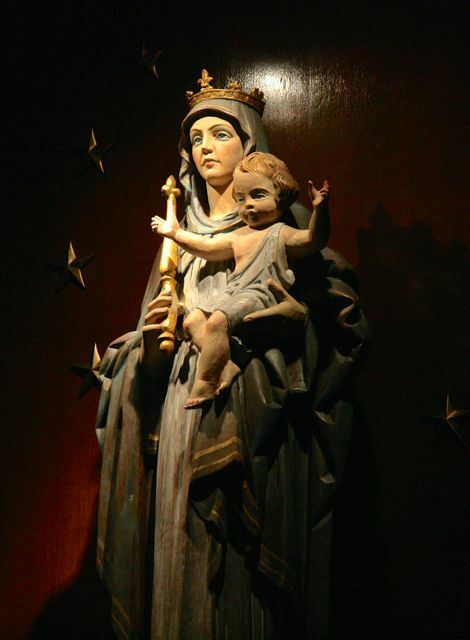 Items of decor like the stained glass windows, paintings and the clusters of statues provide “Catholic” accents. Today many undoubtedly interesting aspects of the church are inaccessible. There is a bookstore, a Lady Chapel, a baptistry – all closed on recent visits. (Above) In 1939 Archbishop Spellman dedicated the new church which Cardinal Hayes did not live to see completed. This window, donated by the new Archbishop of New York, includes the depiction of the old St. Andrew’s church in the upper left hand corner. 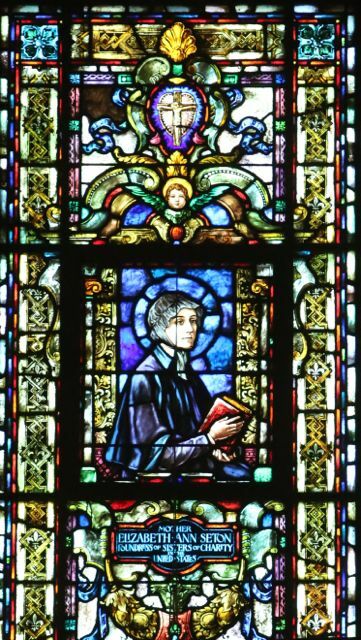 (Above) A window dedicated to St. Thomas More – how appropriate in the center of the city’s courts, police and administration! 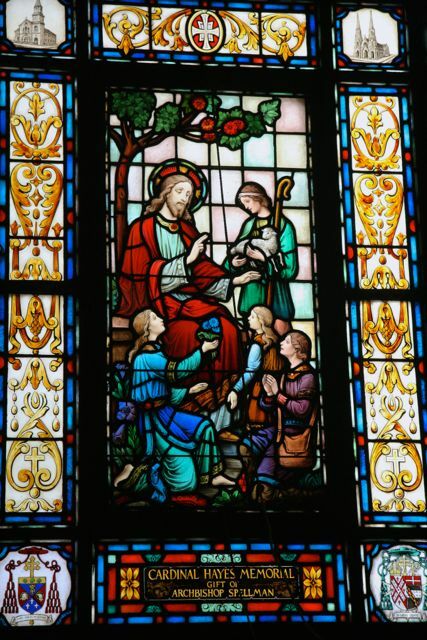 And as the window states “Model of Christian Manhood” – would the Church dare to inscribe that today? 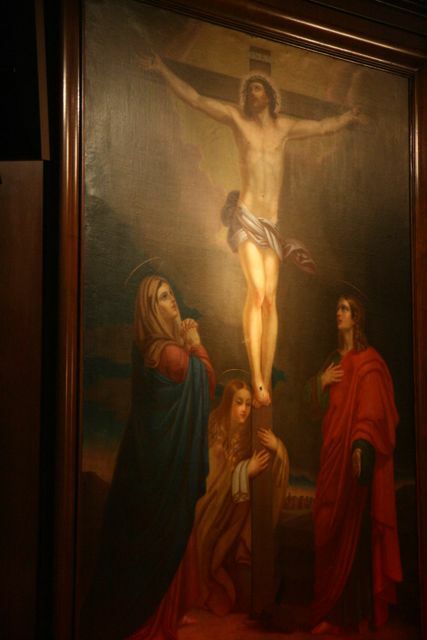 (Above)This painting adorned the altar of the old, pre-1939 church of St. Andrew’s. (Above) As in most older New York churches, statues have a tendency to multiply. After 1939 St Andrew’s soldiered on as one of the city’s grandest commuter churches. 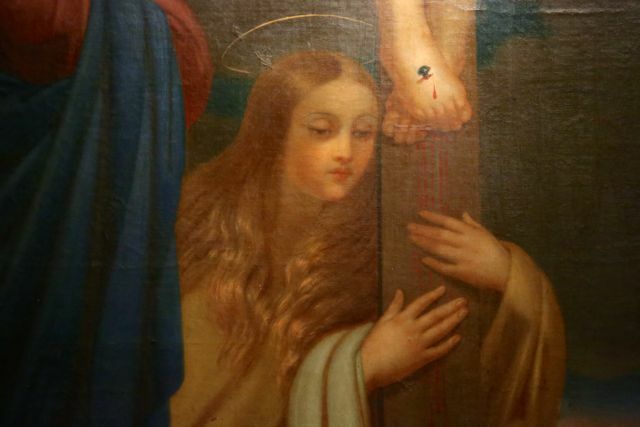 Yet in the more recent post-conciliar decades the zeal of the laity has diminished – particulary of such of the laity involved the administration of justice, we ask? – and the number of priests has plummeted. At some point St. Andrew’s was given over to the care of a religious order. And in “Making all Things New” it was merged into another parish, with reduced activities and opening times. It is mysterious why this parish should experience such reverses in the midst of the downtown residential development boom – and given its close proximity to the once-Catholic NYPD. The restricted opening times and limited number of services will undoubtedly accentuate the problem. One recent morning, on workday, I saw nobody in the church between 8:00 and 8:30 except for a brief appearance of the janitor. And on a recent weekday afternoon there was only a congregation of around twenty – almost all women – attending Mass. 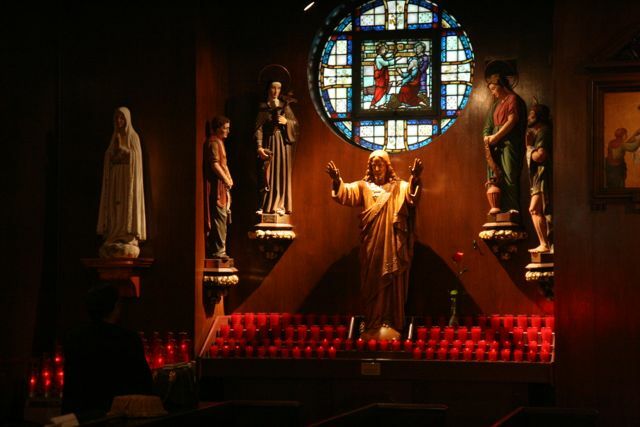 But somebody is keeping most of the banks of (artificial) votive lights lit – and are not those Catholics participating at any level in the nation’s justice system in need of greater spiritual guidance than ever in view of the recent and continuing judicial outrages? We do hope St Andrew’s remains, for to close it would send one more clear signal to the legal community – one critical pillar of the American commonwealth – that the Church is abandoning any attempt to shape the life of the city, the state and the country.